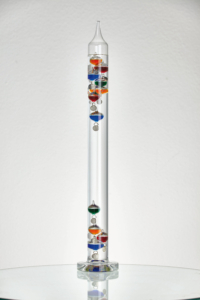 Liquid thermometer made after the idea of Galileo Galilei (1564-1642). Galileo discovered that liquids change their density depending on the temperature. 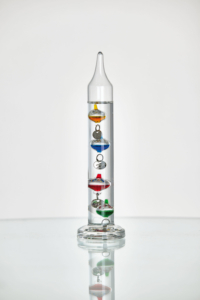 When the temperature rises, the density of the liquid in the thermometer decreases. The comparatively heavier glass bulbs lose buoyancy – their ability to float – and sink. On the other hand, if the room temperature decreases again, the lighter spheres gain buoyancy and gradually go up. 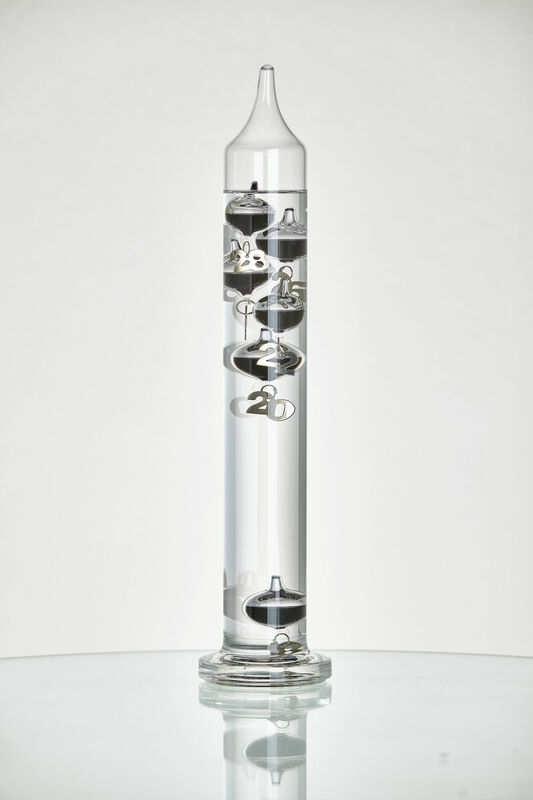 The difference in weight of the 6 glass bulbs is (to a hundredth of a gram) sized so that always the lowest of the above floating glass bulbs in the range of 18 ° C to 28 ° C displays the current temperature.